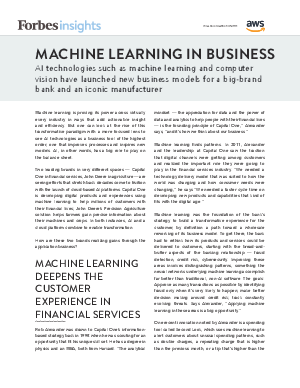 Machine learning is proving its power across virtually every industry in ways that add actionable insight and efficiency. But one can look at the rise of this transformative paradigm with a more focused lens to see AI technologies as a business tool of the highest order, one that improves processes and inspires new models. AI, in other words, has a big role to play on the balance sheet. Two leading brands in very different spaces — Capital One in financial services, John Deere in agriculture — are seeing efforts that stretch back decades come to fruition with the launch of cloud-based AI platforms. Capital One is developing digital products and experiences using machine learning to help millions of customers with their financial lives; John Deere’s Precision Agriculture solution helps farmers gain precise information about their machines and crops. In both instances, AI and a cloud platform combine to enable transformation.